The Inhibitor VCI has a proven track record of protecting a variety of metals such as Iron, Steel, Brass, Bronze, Copper and many others. At Scientific Control Laboratories in Chicago, IL (independent laboratories) they prove The Inhibitor works. Testing began by purchasing identical shotguns, fishing tackle and hand tools. First we cleaned their surfaces to remove any protective coatings, then placed them into identical cases, then we placed them into identical cases, one identical set with The Inhibitor and one without. The cases were then placed into a large moisture tank filled with 45 gallons of water that was maintained at 95 degrees Fahrenheit, 100% humidity for five days, and the photos (taken only minutes out of the moisture chamber) show the results. During our testing, only the Inhibitor cartridge (plug) was used. We did this to show how effective our plug really is. Don't forget our Inhibitor wiping cloth or gun shields - make it an Inhibitor System. The hammer on the top contained The Inhibitor plug. The one on the bottom did not. See the difference! Each combo starter pack includes (1) 4 oz. 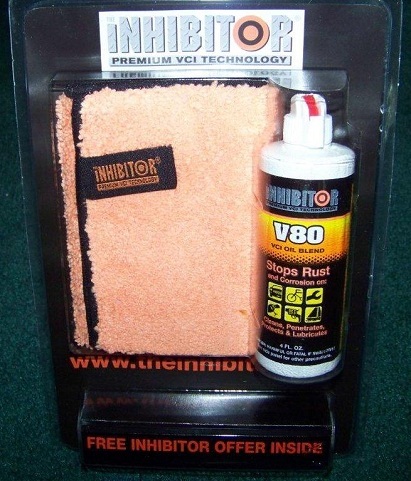 container of Inhibitor V80 oil blend, a micro fiber wiping cloth & a Free inhibitor offer Inside. The Inhibitor has been a supporting Law Enforcement Officials and Military Personnel from day one. We believe in those who keep us safe and those who keep us free. We thank you, and solute you, with our sincerest gratitude. The Inhibitor wants to make sure you stay safe while in the line of duty. That means knowing that the equipment you use is in top working order and will not fail you. We have set up absolute best pricing on a selection of our rust prevention products through our GSA contract, and we invite you to save money and "Protect the Equipment that Protects You!" 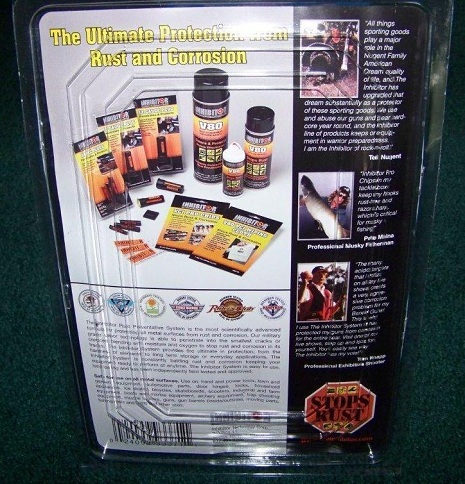 Our specialized Volatile Corrosion Inhibitor is second to none in the fight against rust. Our VCI nano-technology penetrates the smallest crevices of your weapon and stops rust before it has a chance to start.